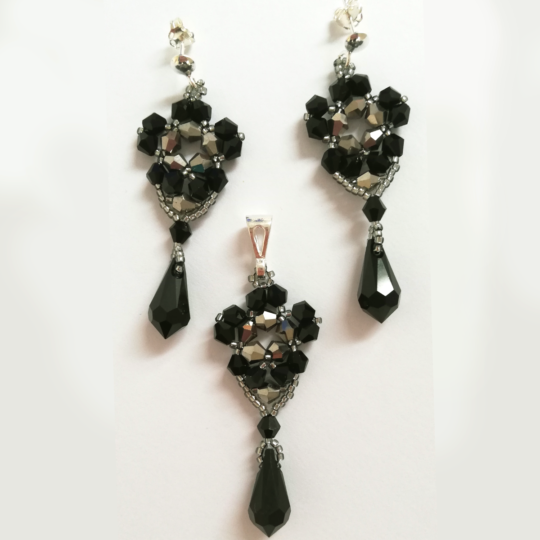 Very impressive, extraordinarily, Boho style earrings in black - silver shades. Carefully braided with tiny Toho beads and fine Chech crystals. Extremely impressive and shiny jewelry !!!! MATERIALS: Chech crystal beads 4mm, TOHO beads in black, silver and graphite colors. English earwires and little tie – sterling silver MEASUREMENTS: Earrings - 7,5cm without earwires. Pendant - 10cm EXTRA OFFER: We offer earwires to choose from: open earwires and closed English (shape like in the picture). Earrings can also be ordered on clips. Please let us know in a message during purchasing the product. Beautiful, eye-catching necklace, brancelet and earrings in violet and light peach. Carefully braided with luxurious Swarovski crystals of excellent cut quality. Extremely impressive and shiny jewelry !!!! MATERIALS: Swarovski crystals 14mm, 16mm and 4mm, TOHO beads in silver and light peach colors. Earrings are hanging on English earwires. Bracelet and necklace - closure ended with a lobster lock and extender chain - sterling silver. MEASUREMENTS: Earrigns: 5,5cm without earwires. Bracelet length: 20cm plus 4cm of extender chain. Necklace length: 42cm plus 4cm of extender chain. EXTRA OFFER: We offer earwires to choose from: open earwires, closed English (shape like in the picture) and studs with hanging earrings. Earrings can also be ordered on clips. Please let us know in a message during purchasing the product. You can also order a bracelet and necklace to the specified measurements. FREE service! Beautiful, eye-catching necklace, brancelet and earrings in blue. Carefully braided with luxurious Swarovski crystals of excellent cut quality. Extremely impressive and shiny jewelry !!!! MATERIALS: Swarovski crystals 14mm, 16mm, Chech crystal beads 4mm, TOHO beads in blue and sapphire colors. Earrings are hanging on English earwires. Bracelet and necklace – closure ended with a lobster lock and extender chain – sterling silver. MEASUREMENTS: Earrigns: 5,5cm without earwires. Bracelet length: 20cm plus 4cm of extender chain. Necklace length: 42cm plus 4cm of extender chain. EXTRA OFFER: We offer earwires to choose from: open earwires, closed English (shape like in the picture) and studs with hanging earrings. Earrings can also be ordered on clips. Please let us know in a message during purchasing the product. You can also order a bracelet and necklace to the specified measurements. FREE service! Earrings and bracelet made of glass crystals in silver and gray shades. Extremely impressive and shiny jewelry!!! MATERIALS: Crystals in an oval shape and minty, graphite colors, TOHO beads in silver, round hematite stones. Earrings finished with sterling silver earwires. MEASUREMENTS: Earrings – 5cm without earwires. Bracelet length: 19cm plus 4cm of extender chain. EXTRA OFFER: We offer earwires to choose from: open earwires, closed English and studs with hanging earrings (shape like in the picture). Earrings can also be ordered on clips. You can order a bracelet to the specified measurements. FREE service! Please let us know in a message during purchasing the product. 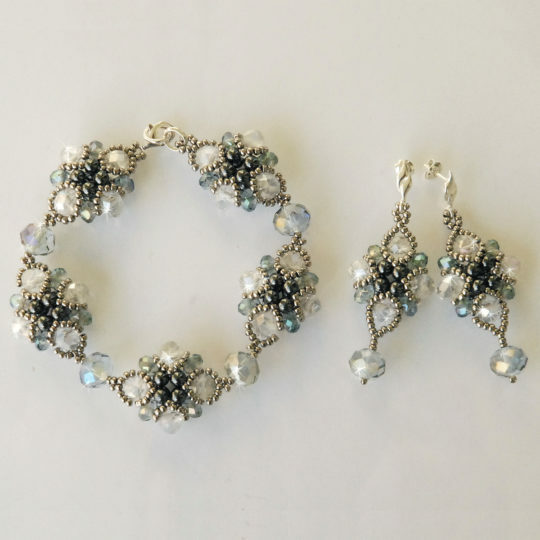 Beautiful, eye-catching bracelet and earrings made of white glass pearls and glass crystals. Carefully braided with luxurious Swarovski crystals of excellent cut quality. Extremely impressive and shiny jewelry !!!! MATERIALS: Crystals (transparent) in a diamond shape with AB effect and white glass pearls with a diameter 4mm, hanging drop 1,5cm long, Toho tiny beads in silver colors. Earrings finished with sterling silver studs. Bracelets closure ended with a lobster lock and extender chain - sterling silver. MEASUREMENTS: Earrigns: 5,5cm without earwires. Bracelet length: 16,5cm plus 4cm of extender chain. EXTRA OFFER: We offer earwires to choose from: open earwires, closed English and studs with hanging earrings (shape like in the picture). Earrings can also be ordered on clips. Please let us know in a message during purchasing the product. You can also order a bracelet to the specified measurements. FREE service! Crystal set "Woven of Stars" made using beading technique contains of thousands small crystals and glass beads. Beautifully shimmering and shining in the light, giving you and your stylization a unique glow. Beautiful, eye-catching jewelry in snow colors. 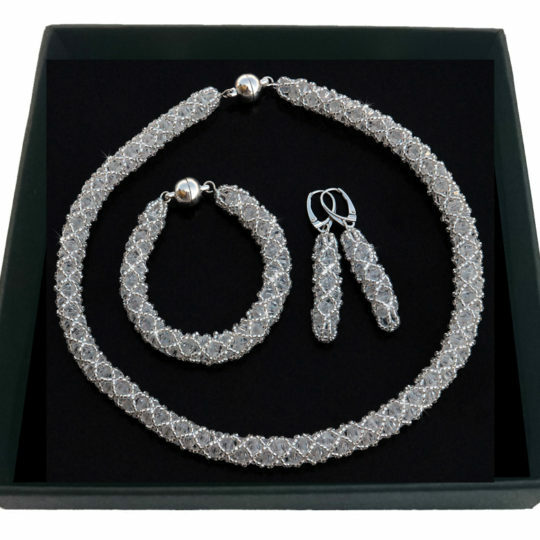 This set consists of a necklace, bracelet and earrings. MATERIALS: 4 mm glass crystals and Toho beads in snowy color; magnetic clasp - metalwork at the necklace and bracelet. English earwires – sterling silver in earrings. MEASUREMENTS: Diameter of the neckles, bracelet and earrings is 1cm, Length of the necklace - 43cm, Length of the bracelet - 18cm (fits wrist circumference: 15-16,5cm). Earrings – 4,5cm without earwires. EXTRA OFFER: You can order a bracelet and a necklace to the specified measurements. FREE service! Necklace and Bracelet has a very comfortable and strong magnetic clasp (metalwork), thanks to which the jewelry is easy to put on. AVAILABILITY: order implemented to 14 days working from the payment registration. Bracelet “Marilyn” SEDNA and Earrings "Elizabeth"
Wed. the entire bracelet: 7.5 cm. Earrings: 3,5cm x 2,2cm without clips. EXTRA OFFER: You can order a bracelet to the specified measurements. FREE service! For alternative to clips, we offer earwires to choose from: open earwires, closed English and studs with hanging earrings. on open or closed English earwires. Please let us know in a message during purchasing the product. FREE service!